Gion Karoku is on the south-side of Gion, on an area where you have a plethora of choices when it comes to fancy dining. It’s a popular Japanese BBQ (Yakiniku) restaurant where you can enjoy the best beef possible while you enjoy a view of the inner garden. All the meat served at Gion Karoku has to meet the strict quality standards of the best Japanese Black cattle, which is why they only serve beef with a rating of A4 or better. The meat here is fatty and full of umami, but the taste is very refined, as expected from meat of this caliber. The beef cut with which you can taste this to its full potential is the under blade roast, which literally just melts in your mouth. The restaurant is also famous for its dessert room. After you finish enjoying your meal, you’re guided to the dessert room on the second floor. The spirit lamps on the table are all lit, and the atmosphere is fantastic, perfect for something sweet after a tasty meal of wagyu beef. With the Kiwami Course, you get to enjoy Karoku’s high-quality Japanese beef to the fullest. This course doesn’t contain any offal, so even those who don’t like beef innards can enjoy it. The takikomi gohan (seasoned steamed rice) contained within this course is absolutely delicious. In the picture, you can see some of the meats that you get with this course (in the picture: tenderloin, chuck, and chuck roll). The under blade roast even looks beautiful, but the taste is something I’d also like you to experience. You can have it with wasabi made in Shizuoka Prefecture or Karoku’s special tare, though it’s really good with either one. This Karoku classic is eaten by grilling the tongue with the green onion and grated green onion inside it. While some of our readers may not be so versed in the world of beef innards, the tongue is a fairly easy one to start with, and at Karoku it tastes absolutely phenomenal, so I wish you’ll give it a try. You can enjoy desserts and a cup of tea on the second floor after you finish your dinner, so it is my wish that you go up to the second floor to enjoy this room. The feeling you get here, reminiscing about the beef you just had; it’s just special. The staff will help you grill the meats recommended. That’s why you get to eat the meat when it’s at its absolute best. 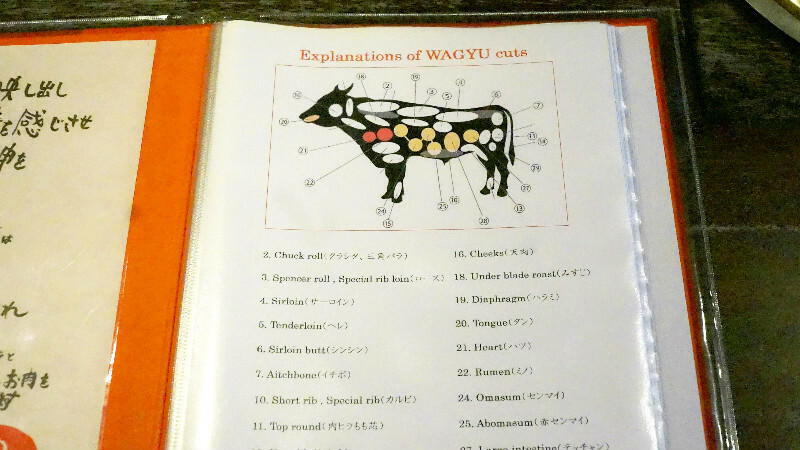 The English menu has the names of the parts of cow written on it, so you can look at this chart while you order. Karoku offers Japanese beef of only the highest quality, but the restaurant is not only great because of this. Their service is top-notch, and the atmosphere is pretty much like nowhere else. The dessert room on the second floor is the epitome of this; the feeling at the dessert room is that of utmost comfort and luxury. It’s such a nice experience to enjoy high-quality beef from a Japanese garden! The melt-in-your-mouth beef and the wagyu rice dish were so good I’m probably never going to forger them. The dessert room was something else, it was a romantic space lit by candlelight that was just the perfect ending. The staff was really attentive and friendly, and I felt like I was served very well. You need to taste the beef here! A 12-minute walk from Keihan Gion-Shijo Station or a 15-minute walk from Hankyu Kawaramachi Station. New Year’s holidays and Mondays (in the case Monday is a national holiday, the following day). They have staff who can speak English, their menu is in English, and because the restaurant is very popular among foreign tourists they are also very used to foreign customers. So this restaurant is an easy choice! Enjoy a simple, yet luxurious, breakfast at Breakfast Kishin Kyoto!